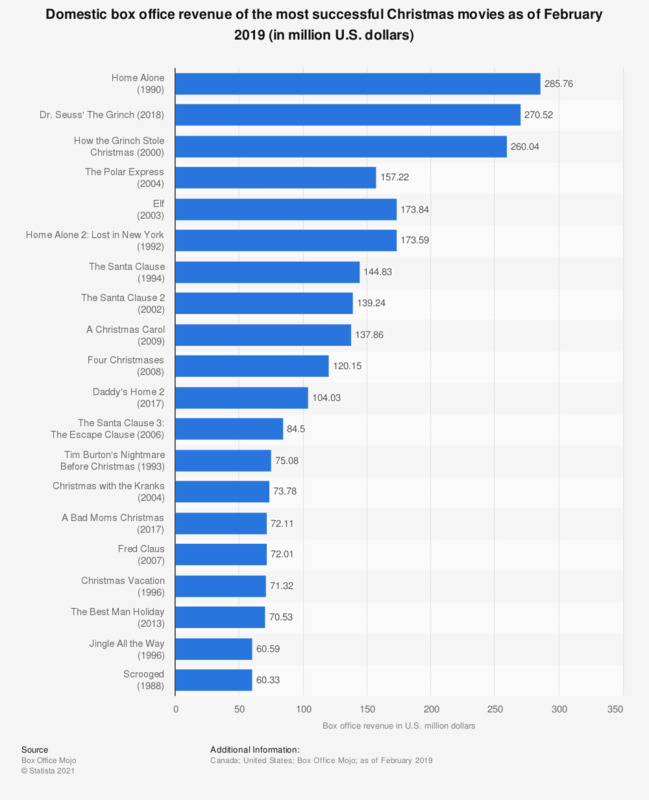 This statistic presents the 20 most successful Christmas movies at the North American box office. The most successful Christmas movie is Home Alone, with a lifetime gross of over 285.7 million U.S. dollars. The 2018 version of the Grinch was in second place, earning more than 270 million U.S. dollars at the domestic box office. Jim Carrey's interpretation of the Dr Seuss classic came in third place, with revenue on just over 260 million U.S. dollars. Despite the popularity of Christmas movies, which are very often repeated every year during the holiday season, none of them have earned enough money to obtain a spot as one of the most successful movies of all time, based on revenue earned. As of 2019, Avatar still leads the way, having earned approximately 2.79 billion U.S. dollars, followed by Titanic with around 2.19 billion U.S. dollars. The global box office recorded a significant growth in just under a decade, from 2005 to 2017. In 2017, the total box office revenue amounted to approximately 40.6 billion U.S. dollars, up by roughly 14 billion U.S. dollars compared to 2007. With the steady growth of revenue year over year, further success is expected over the next several years. When considering the highest grossing movies in North America from 1995 to 2017, the most successful genre was adventure. These movies grossed a total of roughly 60 billion U.S. dollars in the span of over two decades.